Weather based irrigation controllers will modify your clients watering schedule for weather conditions better than the controller they are using now. Why..??? Because ET (evapotranspiration) based controllers factor in your specific geographical ET factors such as: sunlight (solar radiation), wind, air temperature, humidty and rain. Once these factors are known, the ET rate for your location is adjusted…..daily! The ET controller is wirelessly updated on a daily basis which modifies your base watering schedule (either up or down) depending on local climate conditions. How cool is that? These five basic weather variables of evapotranspiration (mentioned above) influence the plant water requirement (and in turn your weather based controller). As you can guess, this changes the amount of water needed by plants everyday. Measuring these weather factors provides information which will adjust the weather based controller automatically. These five variables change on a daily basis. Sunlight is the cause of water evaporation from plant surfaces (leaves) and the soil. Sunlight also causes plant transpiration, which is the amount of water the plant draws from the soil to survive. Sunlight is influenced by cloud cover, altitude, and shade from adjacent trees, structures and landforms. More or less sunlight will affect your weather based controller. Breezes force air across plant (leaf) and soil surfaces and increases the amount of water vapor removed from the landscape. Wind is influenced by trees, shrubs, nearby structures such as tall buildings and landforms. High winds will affect your weather based controller. Temperature impacts the rate of transpiration from the plant and evaporation from the soil. Higher air temperatures result in more rapid removal of water from the landscape. Higher or lower air temperatures will affect your weather based controller. Humidity is a measure of water vapor content of the air. Lower humidity (dry air) provides a greater difference between moist leaf surfaces and the air which results in an increase in water loss from the plant. Dry air blowing across a moist leaf will result in the plant requiring more air from the plant roots (thereby increasing transpiration). Higher or lower humidy will affect your weather based controller. Rainfall impacts the amount of irrigation water needed. When rainfall occurs, many controllers with a rain switch will automatically turn off an irrigation system for a specified amount of time. One of the many challenges in working with rainfall is estimating the amount of water that is actually stored in the root zone. (effective rainfall). Much of rainfall does not reach the root zone because of runoff or is held in mulch or turf thatch.. Some water will percolate below the root zone as well and be lost, depending upon rain intensity and duration. Rainfall will affect your weather based controller. The sum of water lost from evaporation and transpiration, water used by plants, is called evapotranspiration or ET. All of the factors discussed above will affect the rate of ET and will also change the amount of water a weather based irrigation controller will apply to your landscape. 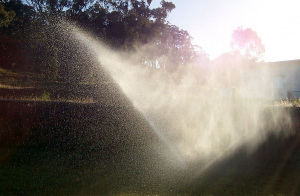 Whether you need to irrigate a residence, commercial shopping center, municipal building, sports field, or parking lot, Atomic Irrigation can help. We’re up to speed on all the latest in technology from low-water spray heads, drip irrigation products and the latest ET Controllers. We can help.